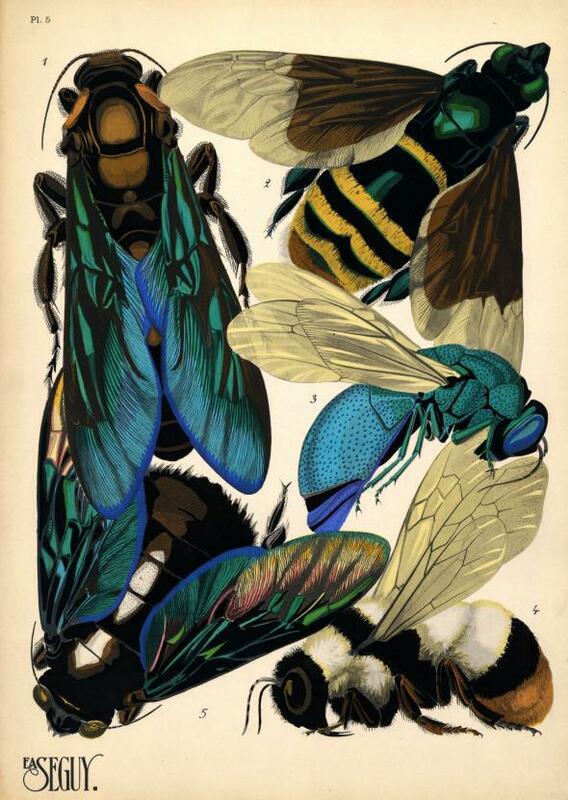 EA Seguy insects history: Prints of insects for art nouveau and art deco designers. E.A. 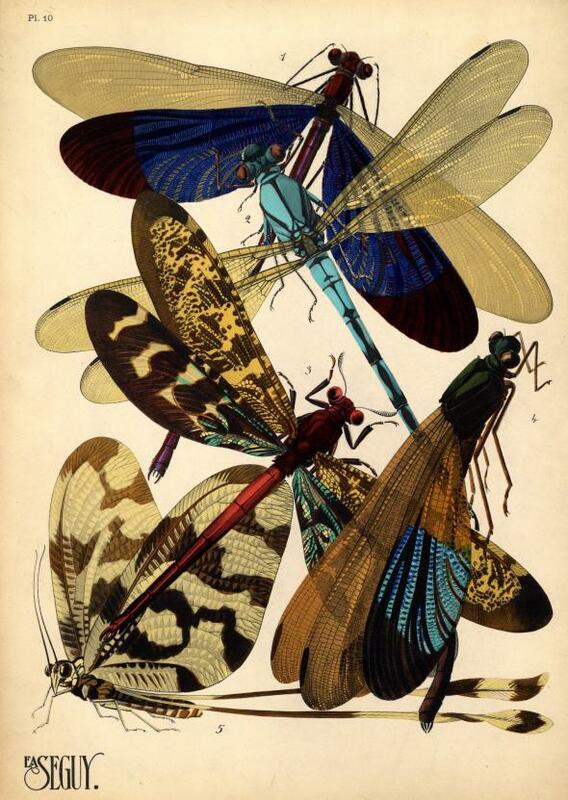 Séguy, a French artist, created these prints of insects in the 1920s and sold them in pattern books to others who might use them for inspiration in coming up with designs for textiles or wallpaper. Like other work in the Art Nouveau tradition, Séguy’s images look to nature for inspiration, adopting a crowded, colorful aesthetic. 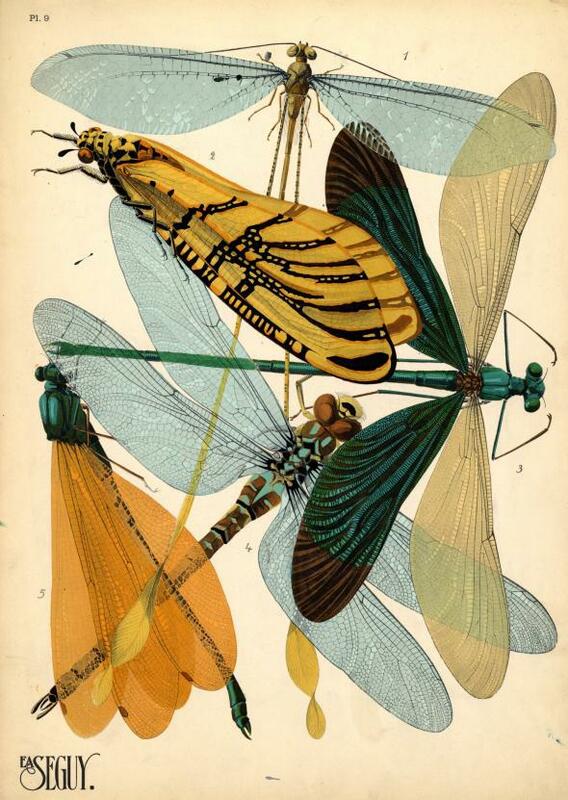 Given their strongly geometrical aspect, his insects might also inspire designers working in the newer Art Deco style. The images were made using pochoir printing, a technique sometimes used in turn-of-the-century France illustration. Ashley Jones, preservation librarian at the Miami University Libraries, writes in a post on Séguy’s work that pochoir was labor-intensive. The idea was to layer stencils on top of one another to create a feeling of depth and texture in a finished print. “While simple in concept, pochoir could become quite complex in practice, with some images requiring the use of 100 or so stencils to produce a single print,” Jones writes. Assembly lines of stencilers applied each layer by hand. Séguy, writes the proprietor of the blog Bibliodyssey, referred to textbooks while doing his work, trying for accuracy along with beauty. 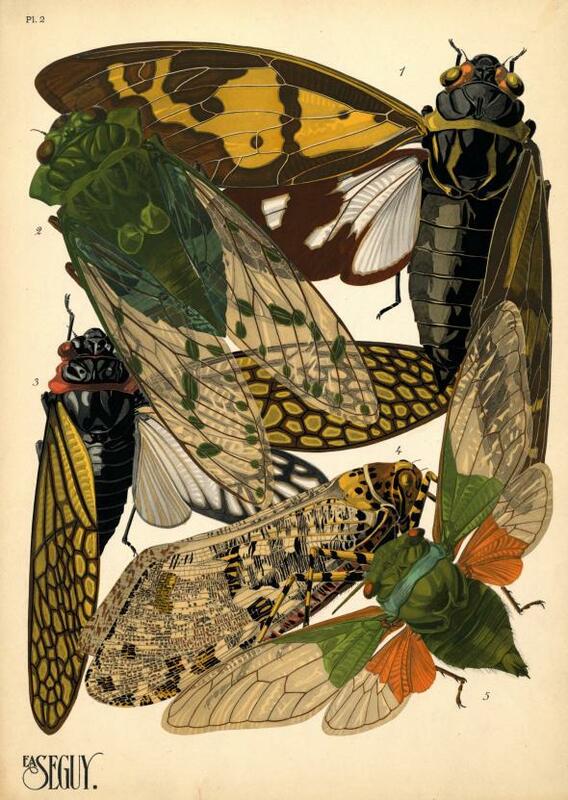 His other natural history–inspired works include prints of crystals (Jones’ post includes some of those images) and butterfiles (viewable, along with the remainder of his insect prints, on the website of North Carolina State University Libraries). Séguy’s notes: 1. Tacua speciosa. Indes; 2. Polyneura ducalis. Indes Or. ; 3. 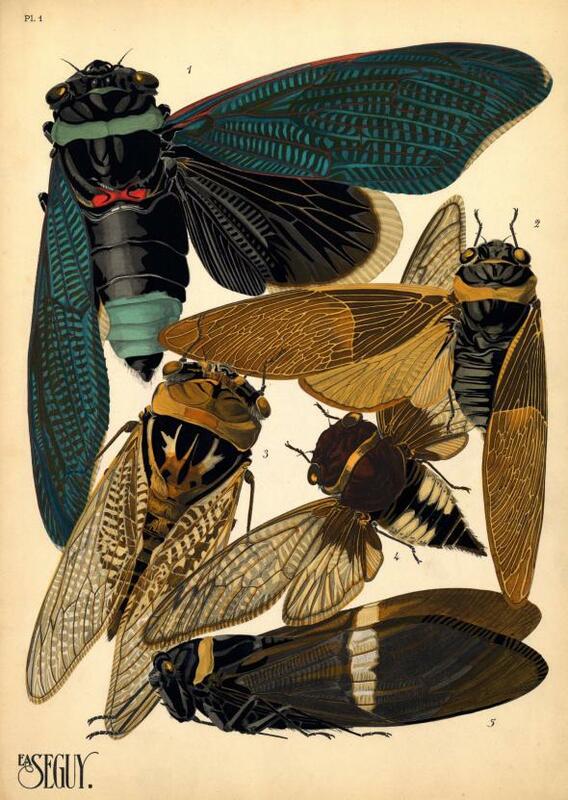 Cicada saccata. Australie; 4. Cicada fascialis. Siam; 5. 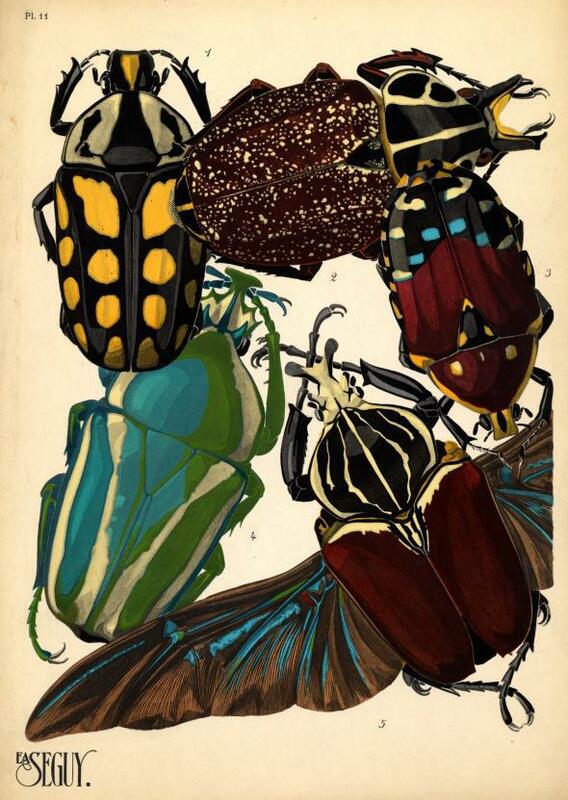 Tozena melanoptera. Indes Or. Special Collections Research Center at NC State University Libraries. Séguy’s notes: 1. Goeana festiva. Indes; 2. Zammara tympanum. Amérique du Sud; 3. Goeana ochracea. Indes; 4. Phenax variegata. Brésil; 5. Hemisciera maculipennis. Amazone. Séguy’s notes: 1. Scolia procer. Asie Tropicale; 2. Eulema dimidiata. Brésil; 3. Stilbum splendidum. Cosmpolite; 4. Bombus lapidarius incertus. Arménie; 5. Xylocopa tenuiscapa. Asie Tropicale. Séguy’s notes: 1. Horaeocerus nigricornis. Madagascar; 2. Acrida miniata. Algérie; 3. Aularches miliaris. Asie; 4. Phymateus Brunneri. Afrique Tropicale; 5. Acanthodis imperialis. Asie. Séguy’s notes: 1. Nemopistha imperatrix. Afrique Oc. ; 2. Tomatares citrinus. Afrique Austral. ; 3. Neurolasis chinesis. Asie; 4. Aeschna Cyanéa. Europe; 5. Mnais earnshawi. Indochine. Séguy’s notes: 1. Calopterix. Australie; 2. Diphlebia nymphoides. Australie; 3. Palpares imperator. Madagascar; 4. Calopterix. Asie; 5. Nemoptera sinuata. Région Méditerran. Séguy’s notes: 1. 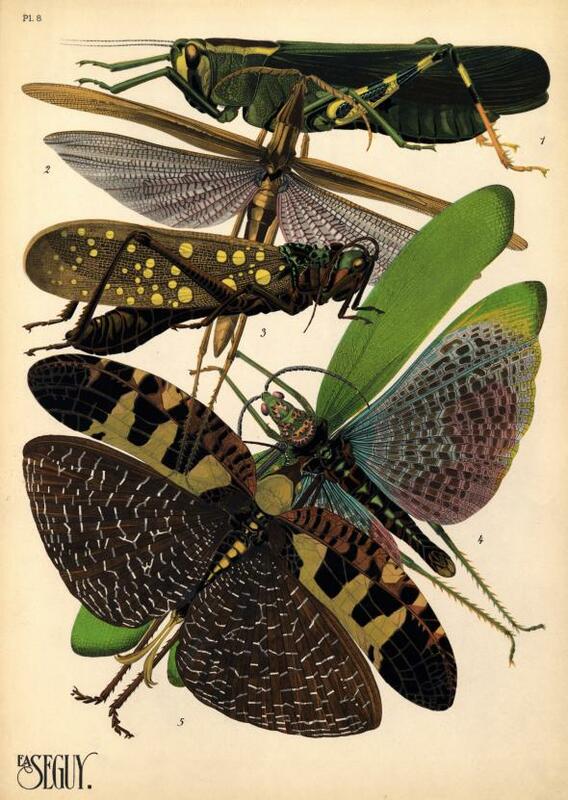 Amaurodes Passerinii. Mozambique; 2. Inca clathratus. Pérou; 3. Histrionica euchroea. Madagascar; 4. Cerathorhina derbyana. Mozambique. 5. Goliathus giganteus. Cameroun.